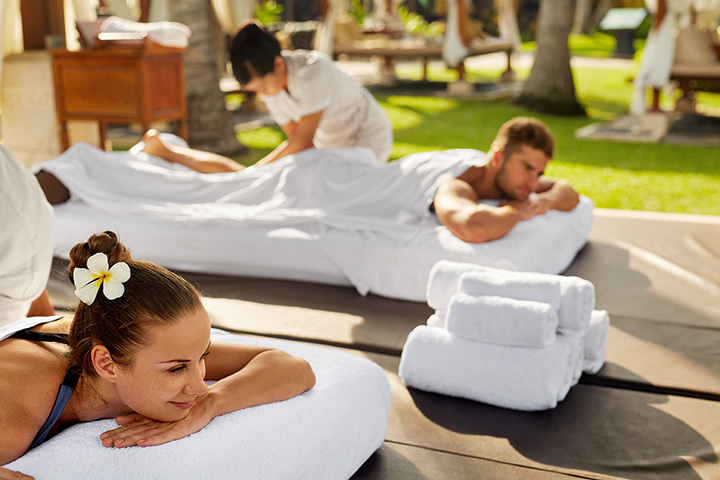 Enjoying a spa treatment while you’re on vacation is the ultimate indulgence. California is king when it comes to world-class spa hotels—some of them are even situated right by the water. From serene deserts to lush vineyards to beautiful beaches, there are tons of spa hotels in California to relax and refresh. Here are the 10 best. Paradise Point’s Spa combines the lush exoticism of the islands with San Diego sensibility to create a relaxing spa experience that is a favorite of Conde Nast Traveler. The spa is continually expanding its selection of signature treatments, facials, and massages. There are high-tech treatments along with natural options so can try whichever you want. The Montage Laguna Beach is one of the most famous and indulgent spas in the world. Using Swiss skincare products and an array of luxury treatments and ingredients, the Montage is a true luxury spa experience. The spa also includes wellness services, a celebrity hair salon, and other extra special treatments. The El Colibri Hotel & Spa is located right on Cambria’s Moonstone Beach. The spa area opens early so that you can enjoy a soak in the outdoor Jacuzzi or loosen up in a steam room before you enjoy your choice of massage therapies. As one of the best spa hotels in the world, Calistoga Ranch offers stunning views in addition to a stunning variety of spa treatments. The rustic chic spa offers scrubs, facials, wraps, massages and more in a beautifully appointed spa that pays homage to nature and different cultures. There is also a selection of services designed for couples and others especially for men. Just outside the tourist area, right on the coast is the Ritz-Carlton Bacara. Enjoy cool ocean breezes and ultra-luxe spa treatments include diamond facials, body treatments, relaxing massages and beauty treatments including mani/pedis, blowouts, waxing and more. Although just moments from the beaches of San Diego, the Lodge at Torrey Pines spa is a forested sanctuary. The elegant spa uses an organic product line in treatments including facials, scrubs, peels, and wraps. Indulge in a massage or a combination of therapies and you can also enjoy saunas, steams, aromatherapy and workouts, yoga classes and other wellness tools. The Spa at Soleil combines the desert’s famous mineral water pools with a selection of spa treatments, including relaxing massages, facials, and more. The modern spa offers soaking mineral baths and pools that are available for day use but if you book a treatment, the pools are free, as they are for guests staying at the hotel. Enjoying the Baths at Roman Spa isn’t an inexpensive experience, but it is one of the world’s most renowned. Here you can do all the traditional spa stuff, like soaking in a mud bath or relaxing in geothermal spring water. There are also massages, facials and other treatments—or go for broke and try them all. The Mount View Hotel & Spa offers a vast variety of spa treatments that you can experience solo, as a couple or even a group. There is a dry salt inhalation room, mineral whirlpool, tea bar, baths, facials, reflexology treatments, massages, and the ability to create your own unique spa experience. The Monterey Plaza Hotel & Spa is located right in the heart of Cannery Row, overlooking the Pacific Ocean. Spend time on the spa’s sundeck, right on top of the bay to enjoy spa tubs. One of the top-rated spas by Travel + Leisure magazine, the stunning views are complimented by massages, skincare treatments, intriguing “bath rituals,” mani/pedis and more.